Multiobjective optimization approaches for deformable image registration (DIR) remove the need for manual adjustment of key parameters and provide a set of solutions that represent high-quality trade-offs between objectives of interest. Choosing a desired outcome a posteriori is potentially far more insightful as differences between solutions can be immediately visualized. The purpose of this work is to investigate whether such an approach allows clinical experts to intuitively select their preferred DIR outcome. 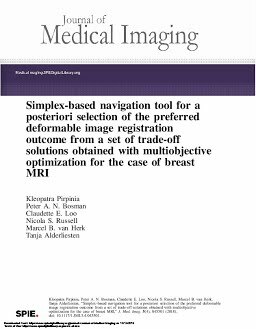 To this end, we developed a simplex-based tool for solution navigation and asked 10 clinical experts to use it to choose their preferred DIR outcome from sets of trade-off solutions obtained for 10 breast magnetic resonance DIR cases of low (prone-prone DIR; n = 5) and high (prone-supine DIR; n = 5) difficulty, of patients and volunteers, respectively. The usability of the software is subsequently evaluated by the observers using the system usability scale. Further, the quality of the selected DIR outcomes is evaluated using the mean target registration error. Results show that the users are able to identify and select high-quality DIR outcomes, and attested to high learnability and usability of our software, supporting the validity of the presumed added value of taking a multiobjective perspective on DIR in clinical practice.